The genre conventionally known as anime runs the gamut from fast action television shows with demon butlers who are ready to serve you tea, and protagonists dropped into strange worlds that they never question, to the passionate artistry of Hayao Miyazaki at Studio Ghibli and Satoshi Kon at Madhouse Inc. In addition there are are slice-of-life animes such as My Neighbor Seki and artistic shorts like Ohayō, the last piece by Satoshi Kon before his tragic passing. The Black Butler began as a Manga but has inspired several Anime series. In English-speaking countries anime specifically refers to works of Japanese-style animation. They frequently blend fantastical worlds with reality, where the fantastical is subject to the logic of dreams and deeply rooted in Japanese cultural concepts of the untamed natural world and the yōkai, nature spirits, and monsters, that inhabit it. This week Fiction Unbound contributors Lisa Mahoney and CS Peterson recommend their favorites. Anime is often criticized for its use of exaggerated facial expressions and rapid or jerky movement. Japanese anime great Hayao Miyazaki, who won an Academy Award for his anime fantasy film Spirited Away, lamented that Japanese animators “lacked motivation and used mass-produced, overly-expressionistic products relying upon a fixed iconography of facial expressions, and protracted and exaggerated action scenes but lacking depth and sophistication in that they do not attempt to convey emotion or thought.” Miyazaki’s Spirited Away, his best known film, follows the journey of a young girl from timid to self-sufficient and brave after her parents are lured into an fantasy world of gods and magically turn into pigs during a feeding frenzy. She overcomes challenge after challenge to rescue her parents as she slaves in a bathhouse and pleasure palace for a fantastical variety of memorable and exotic—and sometimes dangerous—deities. 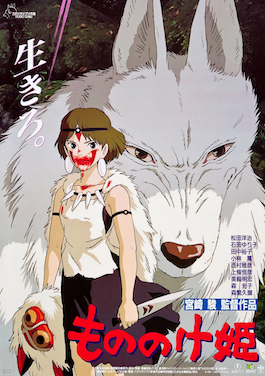 Princess Mononoke is not the “Star Wars of Animated Films,” as the New York Post once declared; Mayazaki’s masterpiece is far more nuanced and complex. Mononoke was raised in the forest by wolves and is a skilled warrior who will stop at nothing to protect her forest, its animals, and its ancient and powerful deities from encroaching human depredation. The setup suggests a classic man-versus-nature tale, but Mayazaki goes far beyond the simplistic dualism of the Star Wars saga (good versus evil = white Jedi versus black Darth). Mononoke’s plot arc is no more important than young warrior Ashitaka’s quest to find a cure for an infection that will turn him evil, and eventually kill him. Ashitaka, raised in a remote village, bears witness to both sides of the story of human progress: impoverished and once-abused villagers are helped by Mononoke’s villain, the Lady Eboshi. Eboshi feels it is her duty to improve the lives of her people—including lepers—and to protect them as much from enemy armies as from dangerous wild animals and their gods, many of which are derived from ancient Japanese folk tales and Shinto beliefs. Meanwhile, as Ashitaka struggles against the poison in his blood, he falls for Mononoke, who does not know how to relate to people. He also falls for the serenely beautiful daytime Forest Spirit/Nightwalker. Every character, whether god or human or animal, is portrayed as both black and white, bloodthirsty and kind, and each must learn to balance these sides more judiciously. Mononoke’s bloody knife and mouth attest to the fact that she is no sweet Disney princess, but a woman determined to do what she believes is right, and willing to use violence when necessary. The animation is visually stunning and reflective of the action, with Miyazaki’s “camera” slowly panning over intricate details in the forest scenes, including a droplet rippling over in a hidden pond, the blaze of light and serenity that surround the Great Forest Spirit, the terrible destruction the Nightwalker causes while blindly hunting its head, and the grim industrial towns. The deer Ashitaka rides moves gracefully across the landscape, and the wild boars are terrifying in their pig-headed, vindictive ugliness. Battle scenes are action-packed, but Miyazaki isn’t afraid to linger over scenes of flirtations between Ashitaka and Mononoke. Enjoy. Satoshi Kon was an inspired animator who passed away in 2010 at the age of forty-six. Despite his brief career, he left behind a body of brilliant animation work. Paprika is my favorite. Long before Inception, there was Satoshi’s Paprika in 2006. The plot centers on a psychologist who has developed a controversial device to assist therapists in helping clients. The machine allows one human to enter the dream of another. Satoshi’s movie is based on a book by Japanese science fiction writer Yasutaka Tsutsui. As you might expect, things soon get out of hand. A well-meaning doctor enters the dream worlds of people who are suffering, intending only good. In the dream world she calls herself Paprika. But Paprika’s good intentions mean little when the device is stolen and a nefarious plot begins to unfold. Characters flee from one mind to another in ever deeper levels of dreaming. Around them, the veil between reality and dreams wears thin. There is dream within a dream, a chase through the subconscious of multiple characters. We see Paprika as a woman, working to integrate the different selves she performs for various others. In the end she births a new creature by swallowing the evil that pursues her. The movie epitomizes the anime themes of visualizing the fantastical-supernatural subconscious and the deep necessities of nature, and showing how these often-ignored elements are woven into our everyday reality.